It's tabouli time! The mint and parsley are going crazy in my herb garden, and farm-fresh tomatoes and cucumbers are starting to hit the co-ops and farmer's markets the city over. (We've even harvested a few cherry tomatoes and one "Early Girl" from our own garden.) Bulk up this summery staple with some cooked chickpeas and you've got yourself one healthy, refreshing lunch to enjoy all week long. 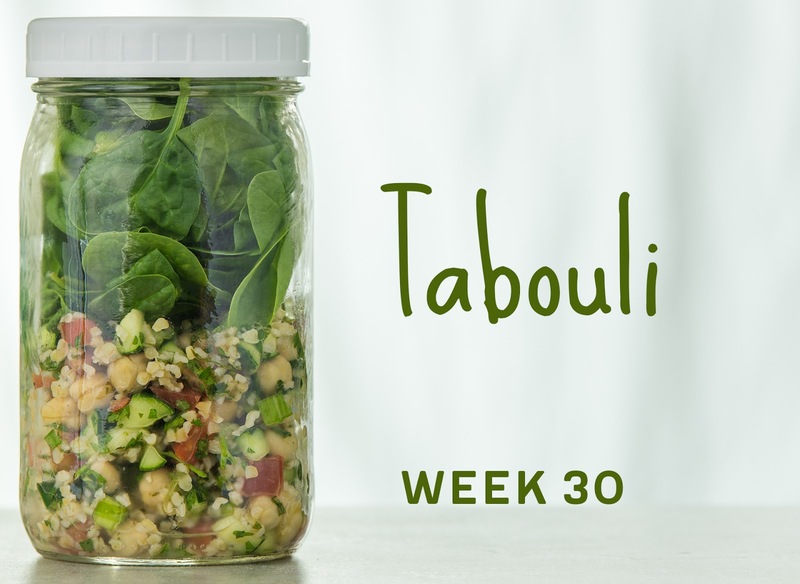 Make the tabouli: combine the bulgur, chickpeas, cucumber tomato, green onion, parsley, mint, lemon juice, olive oil, and salt and pepper. 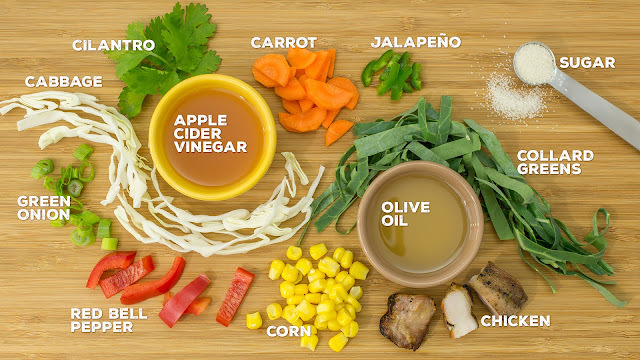 Fold the ingredients together until well-combined. Pack the salads: divide the tabouli evenly among 4 tall quart-sized containers. Divide the spinach evenly among the containers. Refrigerate until serving. TIME-SAVING TIPS: Use 1 can chickpeas, drained, rinsed, and patted dry, for the home-cooked chickpeas. SPECIAL DIET SWAPS: This salad is vegetarian/vegan and nut-free as-is. 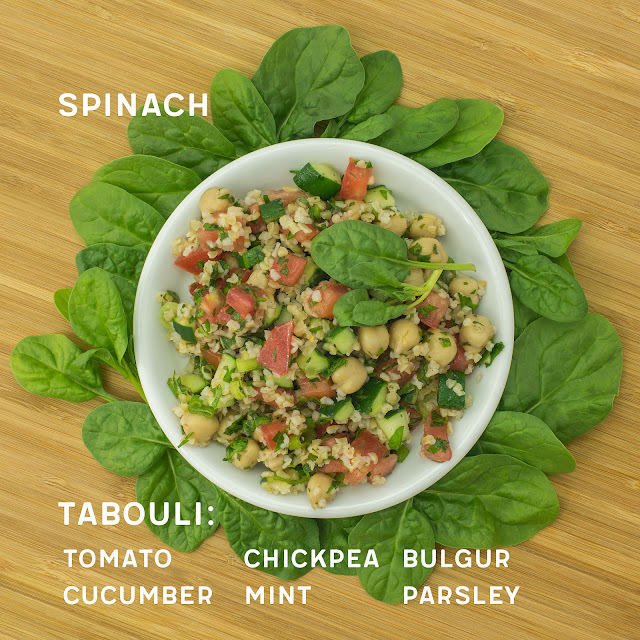 For a gluten-free salad, substitute cooked, cooled quinoa for the bulgur. Several summers ago, I practically lived on cucumber and tomato salads - freshly chopped cucumbers and tomatoes from the farmer's market, dressed simply with olive oil, salt, and pepper, then finished with a shower of feta. This salad never seems to get old for me, although bulking it up with chickpeas, bell pepper, and romaine makes for a more satisfying lunch. (You could pack a few wedges of pita on the side to soak up any remaining tomato juices, but you certainly don't have to.) 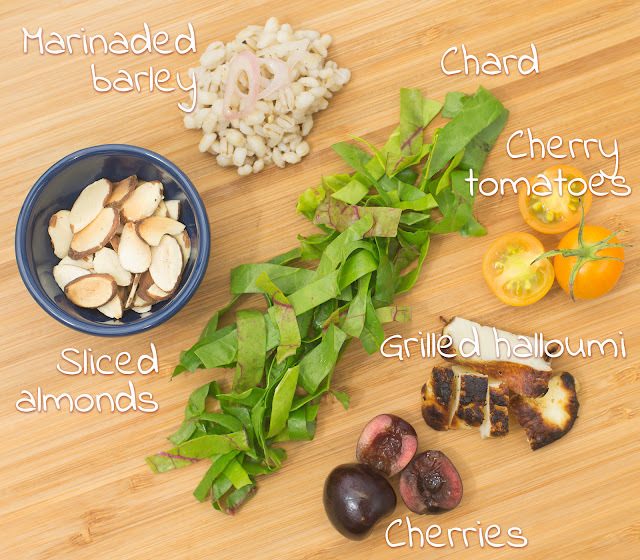 I hope this simple, satisfying salad becomes a regular at your house as well! 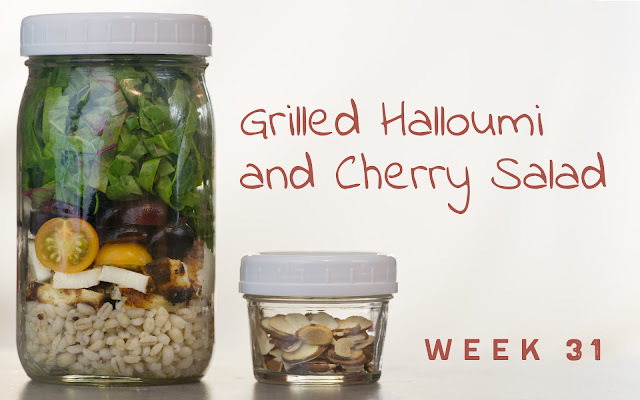 Pack the salads: divide the chickpeas evenly among 4 tall quart-sized containers. 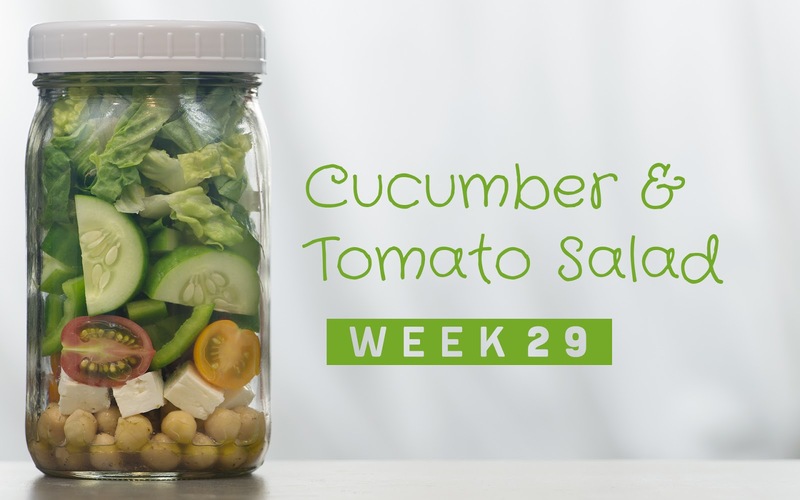 Layer the feta, tomatoes, bell pepper, cucumbers, and romaine in the jars. Refrigerate until serving. SPECIAL DIET SWAPS: This salad is vegetarian, gluten-, and nut-free as-is. 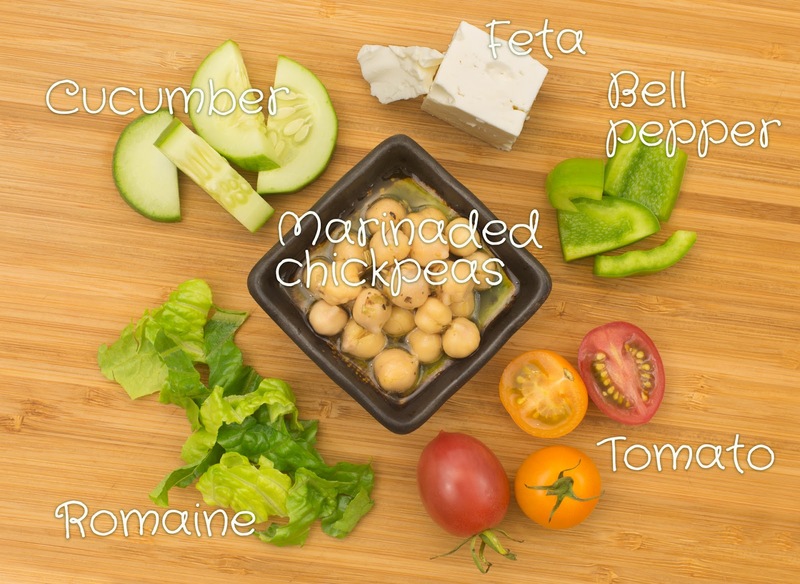 For a vegan salad, substitute your favorite vegan feta for the dairy feta, or double the quantity of chickpeas. This salad, based on a recipe from Real Simple, is a take on "lalab" - a raw vegetable salad typically served with chili paste; this version incorporates a few other Indonesian staples such as curry, peanut sauce, and tofu in place of the chili. This fresh, colorful, flavorful, protein-packed salad makes for a filling, nutritious lunch - I hope you enjoy it! 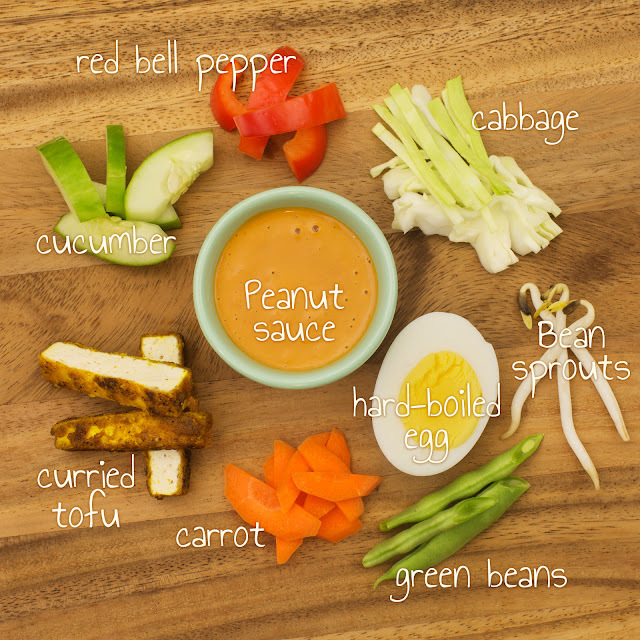 Make the peanut sauce: combine the peanut butter, water, lime juice, soy sauce, brown sugar, curry paste, and salt in a pint-sized mason jar or other tall container. Puree and emulsify the sauce using a handheld stick blender. Pack the salads: divide the peanut sauce among 4 tall quart-sized containers. 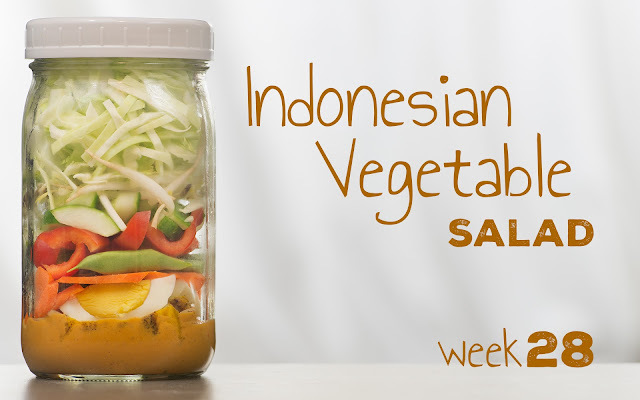 Layer the tofu, egg, carrot, green beans, bell pepper, cucumber, bean sprouts, and cabbage in the jars. Refrigerate until serving. TIME-SAVING TIPS: Add 2 tsp curry paste to 1/2 cup of your favorite store-bought peanut sauce and substitute for the homemade peanut sauce. Use bagged, pre-shredded coleslaw mix instead of the cabbage and carrot. SPECIAL DIET SWAPS: This salad is vegetarian as-is. For a vegan salad, omit the egg. For a nut-free salad, substitute sunflower seed butter for the peanut butter. For a gluten-free salad, substitute gluten-free tamari for the soy sauce, and check to make sure your curry paste is labeled "gluten-free." As we gear up in the U.S. to celebrate Independence Day tomorrow, I'm finding fireworks are very polarizing ... some people love 'em, some people (and dogs) loathe 'em. This slaw, however, is far less polarizing - the tangy-sweet dressing and bold, crunchy, colorful veggies make everyone happy! Happy Independence Day to all! Pack the salads: add 1 tbsp olive oil, 2 tbsp apple cider vinegar, 1 tsp sugar, and salt and pepper to each of 4 tall quart-sized containers. 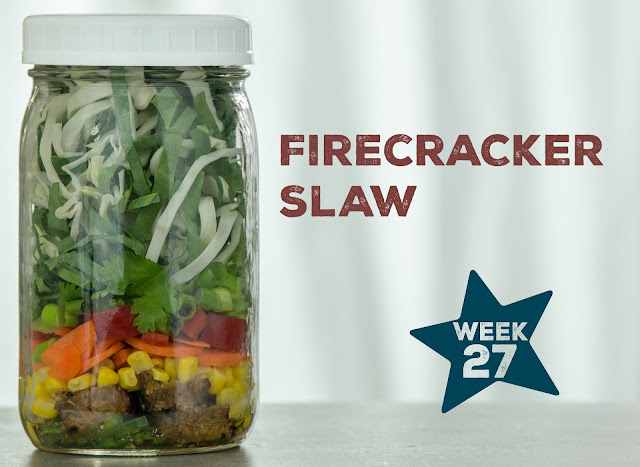 Layer the jalapeño, chicken, corn, carrot, bell pepper, green onions, cilantro, cabbage, and collards in the jars. (You may have extra cabbage or collards; reserve for another use.) Refrigerate until serving. TIME-SAVING TIPS: Use pre-shredded coleslaw mix (green and red cabbage and carrot) in place of the cabbage, carrot, and collards. SPECIAL DIET SWAPS: For a vegetarian/vegan salad, substitute grilled or broiled tempeh for the chicken. This salad is gluten- and nut-free as-is.